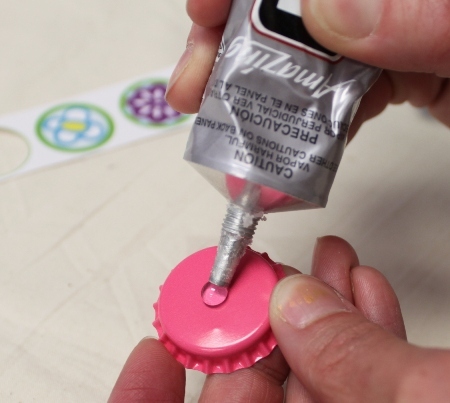 A strong adhesive perfect for securely attaching your magnets and images to your bottle cap. *3D Crystal Lacquer can also be used. Neodymium Magnets are super strong and have a slim profile. The fun part! 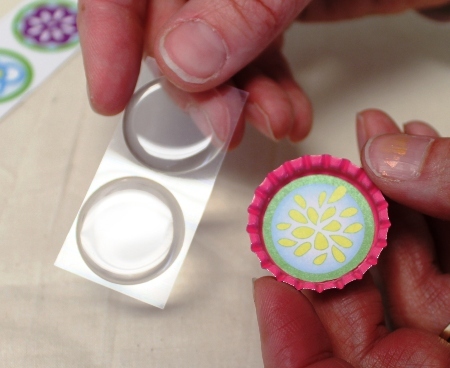 Magazines, scrap papers, photos, Bottle Cap Co Images, Etsy sellers, buttons, beads and charms are all great inspiration for bottle cap magnet sets. 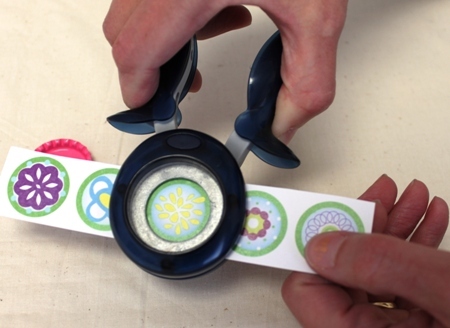 The circle paper punches are quick and fun but if you don't want to use one simply stick your epoxy dot over your desired image and then, using the epoxy dot as your guide, cut out your image with scissors instead. These are perfect for sealing photos and flat paper images. Buy Premium Epoxy Dots, instead of Standard, if you don't want them to yellow over time. This product works as an adhesive to glue your magnet to your cap, as well as your image sealer. Apply a thin coat, or fill your cap, either way works great. Just watch out for bubbles as it dries! Acrylic or glass cabochons are cool! Use 3D Crystal Laquer to adhere them to your design/photo. Punch out images with your 1" Circle Punch. 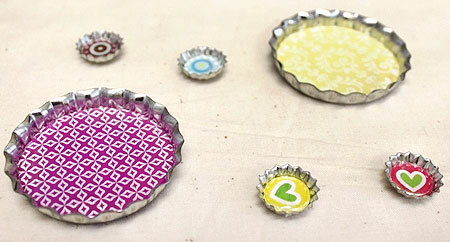 Choose from our assortment of bottle cap images, use scrap papers, photos, magazines... pick something inspiring!! 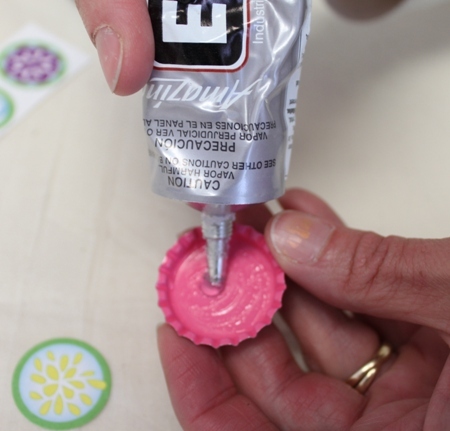 Then glue the designs into your bottle cap using either the 3D Crystal Lacquer or the E-6000 Glue. I used the E-6000, but you can use either, they both work well! Let the glue under your image dry. Cover your design with either an epoxy dot or the lacquer...they both dry clear. The lacquer can take up to 24 hours to dry completely depending on how thick of an application you prefer. Voila! 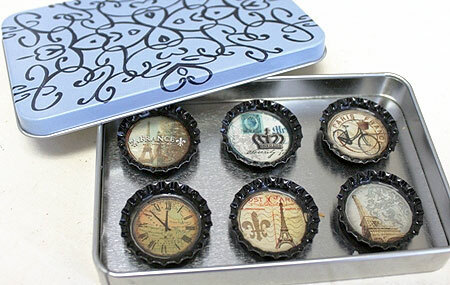 A Beautiful Bottle Cap Magnet! Now you can make a set for yourself, and one for a friend! 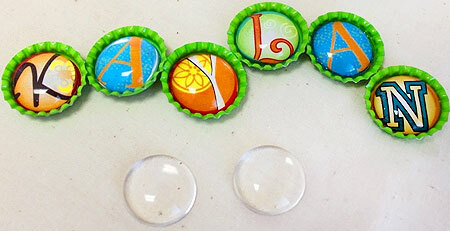 Bottle Cap Magnets are great for decorating fridges, magnetic boards and lockers with meaningful images and sayings. Standard bottle caps, flattened, mini and even jumbo caps give you all kinds of space to create! Have fun! Leave a comment. We'd love to hear from you. 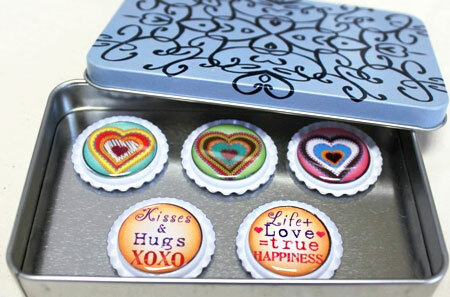 Do you have a source for the little metal boxes that the magnets are kept in? Thank you! We don't sell the metal boxes at this time but are looking into the possibilities. Thanks for the question!! Papermart has metal tins, but best pricing is with Containerandpackaging.com. Would love if Bottle Cap Co sold boxes though!!! Colored ones would be great ... hard to find. Usually only available in silver or gold. Thank you Pamela for your questions. Make sure to check the surface of your images for any dust or particles. Premium Epoxy Dots are a great product and we almost never get complaints about them but every so often there is an imperfection in the dot. Please let us know if this continues to happen and we would be happy to help you out. Just call us at 800-640-9978. Renee, if you are using 3D Crystal Lacquer to seal your images rather than Epoxy Dots you will not be able to use photos/images printed on an inkjet printer. You'll need to use images printed on laser printers/copiers or on a press. Thank you for your question. Call us if you need any further help: 800-640-9978. 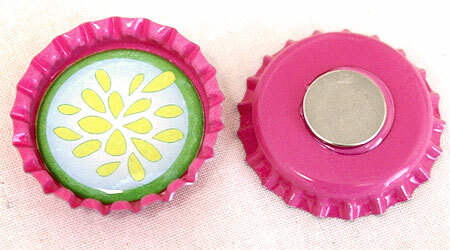 What size of magnet do you recommend for the bottle caps and would you use the same size for both the regular caps and flattened? Thanks! 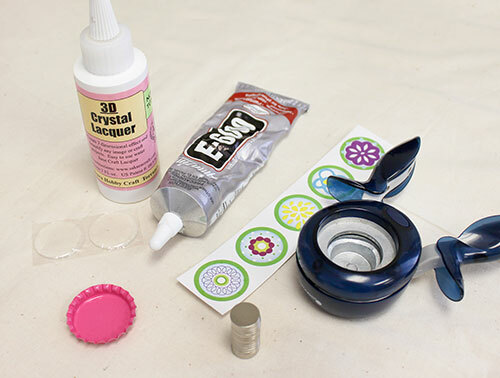 Shirlee, The magnet that we use the most, and the one that is used in this tutorial, is the 1/2" x 1/16" magnet. That's the size we would recommend for both the standard and flattened caps. In order to make a bottlecap keychain, will the 3D Crystal Lacquer work on a photo that was printed on normal copy paper? Or does the photo need to be printed on glossy photo paper? Hello..i am making some breast cancer bottlecap pins. What is best glue to put a brooch pin on back? E6000? Also do you know best glue to glue brooch pin on a pink breast cancer ribbon? We would recommend e-6000 for both parts. It will be a little messier and take longer to dry than some other glues might. But the hold is much stronger in our experience.